Alfa Romeo Giulia Quadrifoglio Performance, Engine, Ride, Handling | What Car? 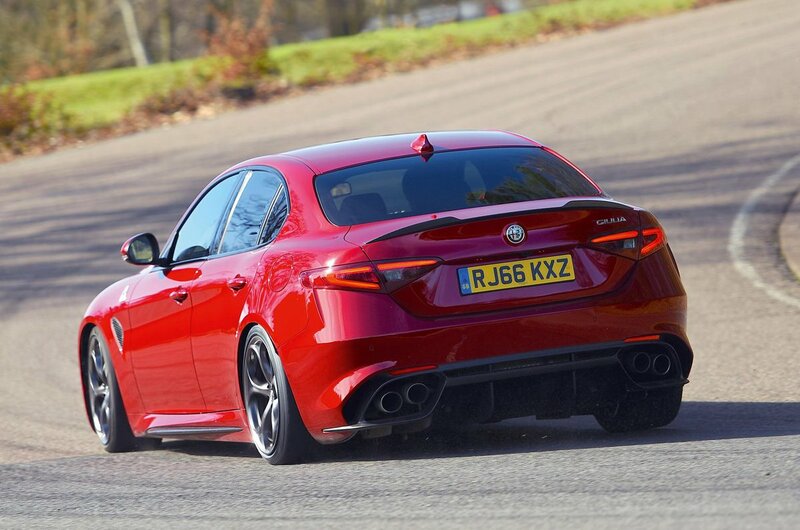 An expensive performance saloon lives and dies by the way it drives and, in this regard, the Giulia Quadrifoglio is right up there with the best. Its engine is hugely entertaining and delivers a button-sharp throttle response with hardly any lag, despite being heavily turbocharged. In fact, floor the accelerator from standstill and it’ll both out-sprint a Mercedes-AMG C63 to 62mph and carry on to a higher top speed, too. The eight-speed automatic gearbox plays a big part in that. 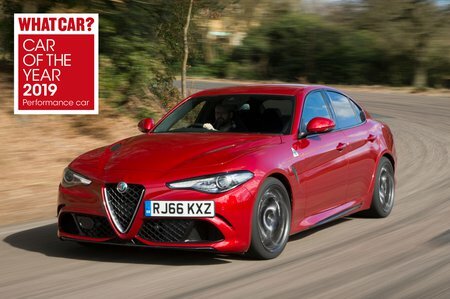 Okay, it dithers and slurs a little at low speeds through town, but it transforms once you start to press on, providing finger-click-sharp manual changes when you use the Giulia’s gorgeous aluminium column-mounted paddles. The engine and gearbox are at their best when you’ve selected the sportiest Race driving mode (Dynamic, Natural and Advanced Efficiency modes sit below it and offer more relaxed throttle response and gearchange settings). Race is also the mode in which the Giulia Quadrifoglio sounds its best, barking loudly as the revs rise and cracking violently on changes. It sounds much more invigorating than a BMW M4 but, many will argue, not as evocative as the C63’s thundering 4.0-litre V8. The brakes are a little disappointing. Not in terms of stopping ability – the optional ceramic brakes in particular provide monumental retardation from high speed – but in terms of feel. Because the Giulia Quadrifoglio’s brakes work via electronics rather than hydraulics, as you press the brake pedal the initial response is a tad vague. There’s nothing wrong with the way the car handles, though. Thanks to a bespoke suspension tune, which can be made softer or stiffer to suit the bumpiness of the road independently of the drive mode selected, there’s next to no body roll while cornering at speed. The Giulia Quadrifoglio also has a clever differential on its rear axle that helps better distribute power as either wheel begins to slip. Of course, if you want to break traction at the rear and steer using the accelerator, that’s possible too – in doing so you’ll discover that, despite its enormous power output, the car’s chassis is so much more forgiving (and considerably less daunting) than the twitchy M4’s. 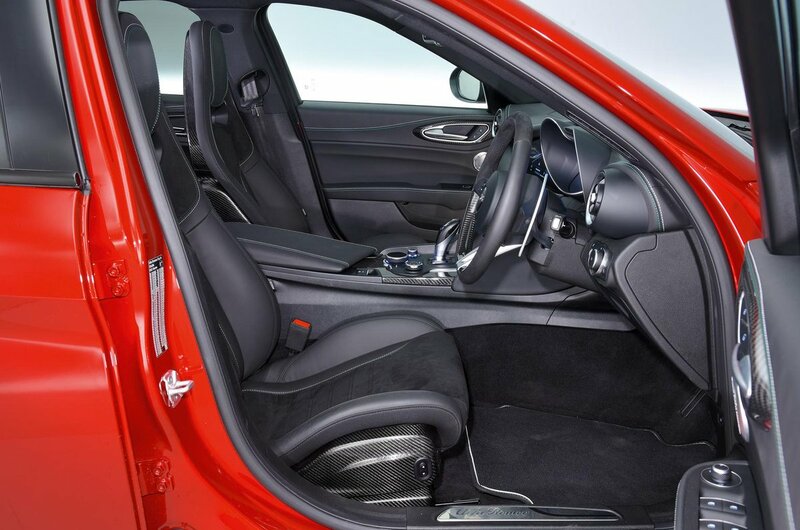 It’s not just out of corners that the Giulia Quadrifoglio entertains. It feels light, poised and nimble when you turn in to a bend, and the quick steering is alert but never nervous. And its front tyres grip hard, so you can carry serious speed. Then there’s the ride. If you think a performance car will be too firm, think again. While you can feel how the Giulia Quadrifoglio's tyres follow road imperfections, the suspension is so supple and effectively damped that it takes the sting out of sharp ridges and never jars you. In fact, the only tarnish to how it drives is a bit of wind and road noise at motorway cruising speeds, but its rivals, particularly the C63, suffer from this rather more acutely.